Latest Tweakware VPN settings on v4.7 was released last night and as expected, working perfectly Airtel 0.0k free browsing. It has been awhile we enjoyed any form of free browsing and as the new year started with pretty good news for bitcoin miners, Airtel subscribers now have a reason to smile as well. Subscribers of Glo network are still enjoying Glo 0.0k internet access using Tweakware software. It is is a tunneling software developed by CASTPORTS that can securely anonymize your internet activity by encrypting all your internet traffic. It can let you access websites and or contents/services that are restricted or blocked by your ISP. e.g Youtube, Hulu , Facebook, Twitter etc. Tweakware VPN is compatible with Windows PC, Android, iPhones. You can check out the complete review of latest Tweakware VPN here. The mobile version and the PC version requires you to upgrade your account to premium to enjoy full access the internet. 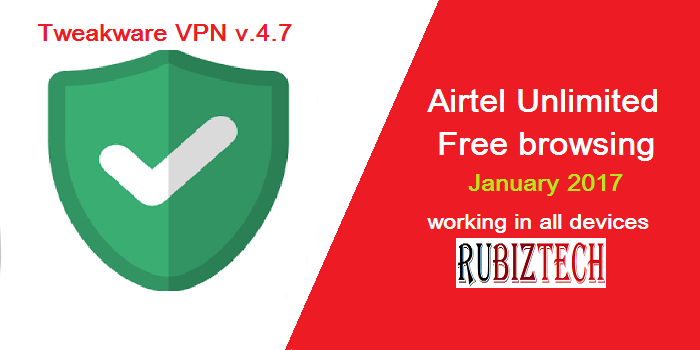 So let’s get started on how to use latest Airtel 0.0k free browsing tweak with Tweakware VPN. Please note that this is only a tweak and can be blocked at any time by Airtel. So, always use the comment box below to ask if it’s still working as the time you are reading this before you subscribe to it. Install the apk and run it. On next page, tap on Account Settings and enter your username and password you got after registration. Now go back to your latest Tweakware VPN app home and click connect and wait for the tweakware to show connected. Once connected, go ahead and enjoy latest Airtel 0.0k free browsing tweak on updated Tweakware VPN. Hello Andrew, it is an app and HOW to use and download it has been explained on the the post above. Maybe you have a more specific question to ask? Thanks for stopping by. Airtel did a major upgrade and stopped the settings. For now, Airtel free browsing with tweakware has stopped. This article will be updated soon with a working settings. For now, NO! Etisalat free browsing with tweakware is limited to 60mb and can’t be bypassed. But once a better option comes out, we will update us with the settings. Hey,the Etisalat 0.0k doesnt seem to be connecting on the new 6.4, can u plz help review it? ?